The East Ayrshire Coalfield Environment Initiative (CEI) are celebrating their completion of 609 hectares (ha) of peatland restoration work in East Ayrshire! Our recently completed work at Weitshaw Muir in the Sorn Estate has delivered 130 hectares of blanket bog restoration on deep peat within the Muirkirk and North Lowther Uplands Special Protection Area (SPA) and the Muirkirk Uplands Site of Special Scientific Interest (SSSI). This internationally designated blanket bog is an important site for breeding upland birds including Hen harriers, Short-eared owls and Golden plovers. 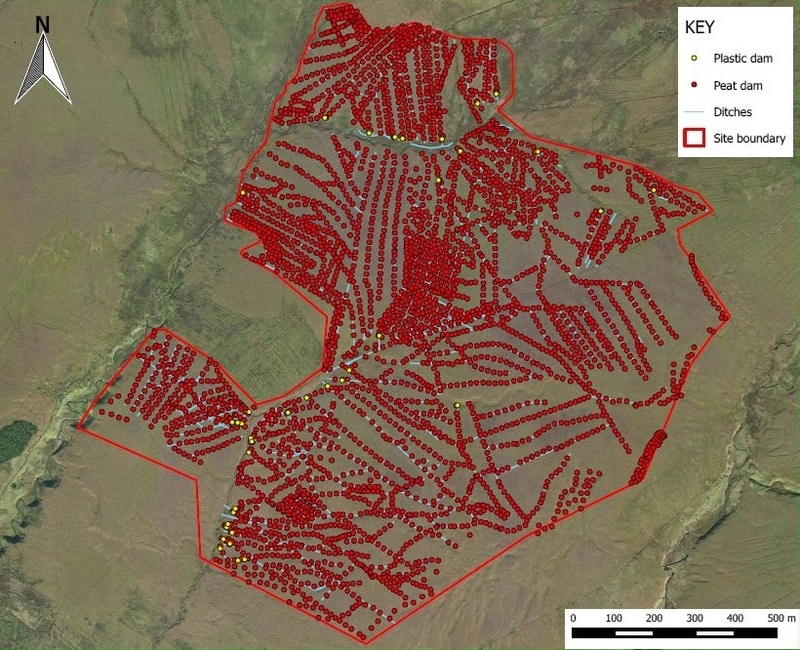 We worked closely with Sorn Estate to successfully balance the conservation work with the Estate’s management of the site for upland sheep farming. 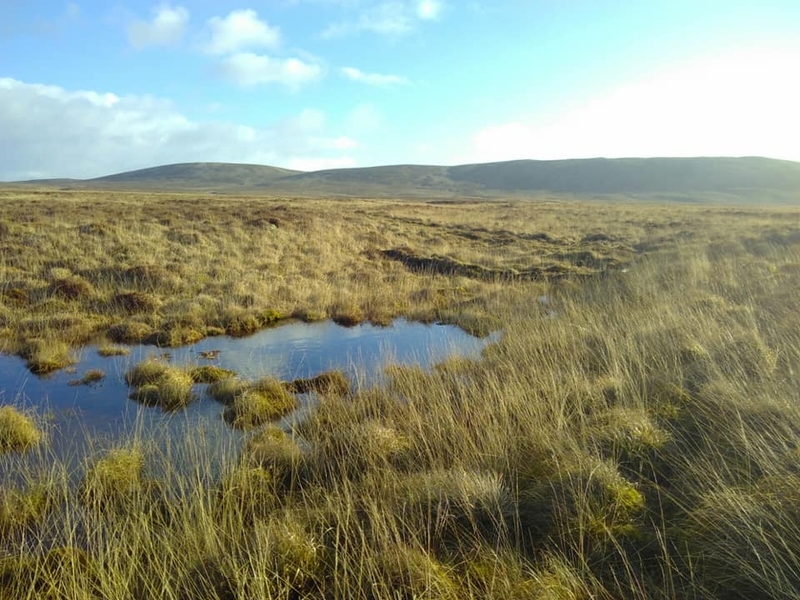 Between December 2018 and February 2019, specialist peatland restoration contractors Openspace (Cumbria) Ltd. installed over 4,000 dams and water-retaining bunds across a dense network of old ditches to rewet the degraded blanket bog. Using a low-ground pressure excavator to minimise damage to the sensitive bog surface, the operator installed a total of 3,706 peat dams, 284 small bunds and 37 plastic piling dams and reprofiled over 5.9 km of ditches and peat edges to help re-wet the deep peat deposits of the site. Peat-forming Sphagnum mosses and bog plants can now recolonise the bog surface and will slowly seal the blocked ditches with new peat. 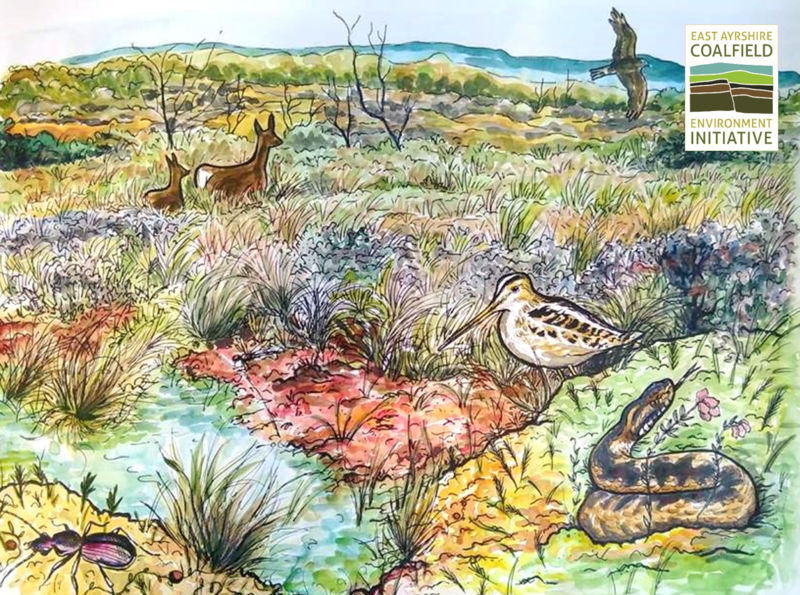 This work will help reduce greenhouse gas emissions, improve local water quality and protect habitat for rare species such as Hen Harriers, Curlew and Large Heath butterflies. A healthy bog acts like a sponge, capturing rainwater during storms and then slowly releases the filtered water into local river catchments throughout the year. On degraded bogs, rain water is channeled rapidly into ditches and then rivers, which increases the risk of flooding events after storms and contaminates rivers with eroded peat. By blocking drainage ditches local rivers and communities will benefit from improved water quality. These special wetlands are home to many rare plants and animals that are specially adapted to the soggy conditions. Draining the bog makes it harder for these wet-loving species to survive and prevents the formation of new peat. Peat is formed from partially-decomposed plant material which accumulates in the wet, acidic conditions. As they grow, peatland plants trap carbon from the atmosphere which is then stored as peat below the bog’s living surface. Drained peatlands release vast amounts of carbon back into the atmosphere. It is estimated that degraded peatlands contribute 5.6% of global, man-made CO2 emissions . The peat soils at Sorn Estate are over 6 metres deep in some places and the work carried out by CEI will help keep the peat locked away. A wet surface covered in bog mosses will also capture more carbon from the atmosphere, helping to combat climate change. The CEI will be hosting regular volunteer events during 2019 as part of its Nature Network Legacy project. The CEI’s volunteers play a vital role in the project by surveying wildlife and taking an active role in conservation work. If you would like to register as a volunteer or find our more please contact CEI Project Manager, Scott Shanks at scott.shanks@ea-cei.org.uk . 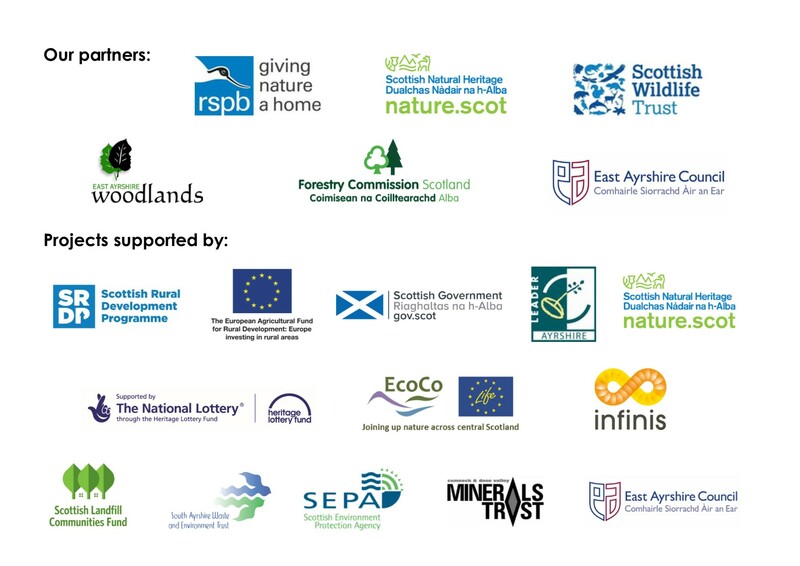 Nature Network Legacy is funded by Scottish Natural Heritage, INFINIS and South Ayrshire Waste Environment Trust (SAWET). THIS PROJECT IS BEING PART-FINANCED BY THE SCOTTISH GOVERNMENT AND THE EUROPEAN UNION—Ayrshire LEADER 2014-2020 Programme.